Niagara Falls is just a day trip away when you visit Toronto, Ontario. On this 8-hour small-group Niagara Falls Day Tour, visit some of the area's top attractions while led by a professional guide. 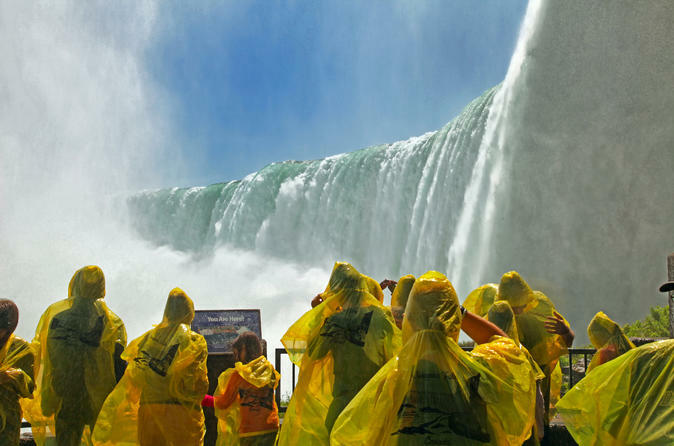 Your tour includes round-trip transportation to and from Toronto, tickets to Skylon Tower and Journey Behind the Falls, and a trip aboard the Hornblower Cruise. Don't pass on the opportunity to experience one of the greatest wonders of the world. This Niagara Falls Day Tour from Toronto includes everything you need - from tickets to the top of the Skylon Tower to transport to and from Toronto. The tour starts at 8am, after your guide picks you up from downtown Toronto. It will take approximately 1.5-hours to travel to Niagara Falls. Upon arrival, you will be treated to a trip to the observation deck of Skylon Tower. As you walk along the observation deck, which is 520 feet (160 meters) above the ground, you will be able to experience some of the most awe-inspiring views of Niagara River, American Falls, Bridal Veil Falls, and Horseshoe Falls. Take your camera because you will not want to miss out on capturing the views on film! If you thought seeing the Falls from above was wonderful, wait for the next stop on your tour. Your guide will take you to Journey Behind the Falls, where you will go on a behind-the-scenes tour of the Falls. Explore a series of cave-like tunnels that allow you to see behind Niagara Falls. The final stop on the tour is a trip aboard the Hornblower Cruise. Once you set foot on the boat, you will be taken on an hour trip onto the waters of the gorge and get up-close to the Falls. In addition to the amazing stops on this tour, you will have the opportunity to see and explore the shops, street vendors, restaurants, and other attractions in Niagara Falls for 1.5-hours before heading home. Please note: Anything you do or purchase during this time is not included in the price of the tour. At the conclusion of the tour, head back to Toronto. Travel time from Niagara Falls to Toronto is approximately 1.5-hours, which will give you time to relax and unwind before the end of the day.